Many of today’s corn hybrids have the potential to reach 500-bushel-per-acre yields—that is, until the seed is poured out of the bag and planted. Likewise, most soybean varieties possess tens-of-bushels of untapped yield potential. Why the big disconnect between yield potential and harvest results? Some of the reasons have to do with geography and weather—things you can’t change. Others have to do with agronomic practices and technology factors you can manage, often in transformational ways. 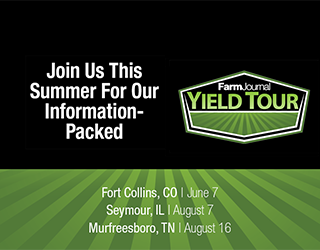 June 7 in Ft. Collins, Colo.
August 7 in Seymour, Ill.
August 16 in Murfreesboro, Tenn.
Each of these three events is designed to help you unlock the door to higher corn and soybean yields and features Farm Journal Field Agronomists Ken Ferrie and Missy Bauer, as well as leading agronomy and technology experts at AgriGold, Trimble and Valent. Along with great seminars and some hands-on training, you’ll have the opportunity to participate in a live U.S. Farm Report taping with host Tyne Morgan and/or an AgriTalk segment with host Chip Flory. Each event is $49 per person and includes lunch and materials. Go to Farm Journal events to learn more about the sessions and to register, or call (877) 482-7203. WE DON'T WANT HIGHER YIELDS......GEEEZ Every single person with at least a 5th grade education knows you don't add inventory to an oversupplied market. And yet, that is all these stupid stupid articles push. Just how f$cking dumb are some of you. More profit YES PLEASE Higher yields, for the love of God, quit already. "I see stupid people, stupid people everywhere"